Open your account and get your free booking system today. on-line booking, payments and notification system! Welcome to the Booking Wizard. 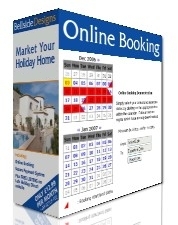 Here you can find out how to harness our online booking system for your website. Check out the demonstrations and examples on how the Web Widgets can easily be added into your existing website. Property owners who have individual subscribers who look after their own properties. Individuals who just want their own Booking Facility for their own website. Brokers who handle all the bookings and operate on a commission basis.